I've been studying moonshine and moonshiners for more than twenty years and even I am a little taken aback at just how many busts we've been seeing in the press lately. For the longest time, the biggest joke about moonshine (laid out by shiners themselves) was that it was a dead or dying art, that moonshiners didn't — to lift the words of Verbal Kint in The Usual Suspects — exist. A TTB agent in a major Southern city once told me that he'd been in that office 19 years and that moonshine "hadn't been a problem" for the last 18 of them. In the last year, though, we're hearing and reading fewer discordant claims from law enforcement officials that they haven't busted a still in years or that this or that bust was "the biggest in memory." Clearly there's a disconnect, or a short term memory problem, or something. 300-odd busts in the last few years might not register in comparison to how many people have been arrested for assault or possession of a controlled substance, but it's hardly non-existent. As fun as it is to tell the story of supposedly non-existent moonshiners, perhaps it's finally time to put that threadbare trope to rest. Yesterday's Franklin-News Post noted that 25 moonshine stills had been located and destroyed last month in three Virginia counties. A further 15 were found that had been incapacitated in previous busts. Three dozen 400- and 800-gallon stills. Kids, the cat's out of the bag; moonshine is not dead, moonshiners are not dying off any faster than those in any other profession, and the busts will continue. The decreasing frequency of claims about the biggest bust in years or the first bust in memory tells me that, whatever else they may be dealing with, more and more state agents are learning how to identify and destroy illicit distilleries. Moonshine Stills Destroyed in 3 Counties from The Franklin-News Post. Chasing the White Dog. 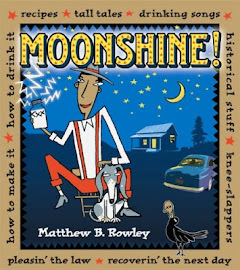 See Max Watman Writes Second-Best Moonshine Book on the Market, my take on his excellent look at modern moonshining. A Writer's Guide to Moonshine. Start with part 2, the body of a talk I gave at the American Distillers' Institute's annual meetings a while back. Or download a PDF of the entire talk here. Not only are would-be distillers learning the craft of making whiskey, but law enforcement has been learning to find and bust them. The centuries-old game continues in Georgia as officers attend Moonshine School.